For Riesling, the Horse Heaven Hills showed a large increase (66%) in acreage, from 875 acres in 2011 to 1,450 acres in 2017. Additionally, the Wahluke Slope showed a significant (60%) decrease in plantings (851 acres vs 343 acres). That is to say, it looks like a lot of Riesling production (presumably by Ste. Michelle Wine Estates) shifted from the Wahluke Slope to the Horse Heaven Hills over the last seven years. See Table 1 below for additional detail. 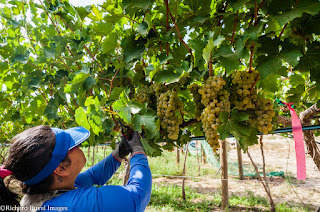 In terms of Chardonnay, the numbers were down or more or less stagnant pretty much across all appellations, with the exception of the Yakima Valley, which showed a 27% increase in plantings, from 3,157 acres to 4,005 acres. See Table 2 below for additional detail. For Pinot Gris, most of the increase is coming from the Horse Heaven Hills (172%) and Yakima Valley (43%). Acreage in the Horse Heaven Hills increased from a modest 138 acres in 2011 to 376 acres (hence the large percentage increase). Meanwhile, in the Yakima Valley, acreage increased from 855 to 1,223. So, in terms of overall acreage, the Yakima Valley was where most of the action was. See Table 3 for additional detail. Finally, looking at Sauvignon Blanc, the Horse Heaven Hills accounted for the vast majority of the increase seen, with acreage going from 492 in 2011 to 858 in 2017. See Table 4 for additional detail. Unfortunately for all these varieties, the Ancient Lakes appellation was listed but contained no data (where data is zeroed for appellation, the report states ‘Represents zero or data not published to avoid disclosure of individual operations.’) This is a shame, as it makes the data incomplete. It also leads to some confusion when comparing the 2011 and 2017 surveys. In terms of the data being incomplete, Riesling is the major player in the Ancient Lakes. So, we do not have a truly accurate portrayal of what’s happening with Riesling on an appellation level without including the Ancient Lakes. However, we can still look at the larger trend going on at the state-level, as presumably the Ancient Lakes variety totals were still included in the Washington totals but were not broken out by appellation. In terms of confusion in the data, if you look at the tables below, there has been a large decrease in Riesling, Chardonnay, Pinot Gris, and Sauvignon Blanc acreage in the areas of the Columbia Valley not associated with other appellations from 2011 to 2017. However, the Ancient Lakes appellation was approved in 2012, after the 2011 survey. So, acreage that was included in the 2011 survey as Columbia Valley would have been moved to the Ancient Lakes appellation in 2017. However, without the Ancient Lakes data for 2017, it’s difficult to say exactly what these numbers would look like. Therefore, we cannot, unfortunately, draw conclusions about the Columbia Valley data in the tables below. So, to summarize, Riesling plantings are on the rise in the Horse Heaven Hills, and Chardonnay plantings are on the rise in the Yakima Valley. The overall trend for the state, however, is a small increase for these two varieties. The Yakima Valley and Horse Heaven Hills are driving the increases in Pinot Gris. Meanwhile the Horse Heaven Hills is driving the increases in Sauvignon Blanc. Overall, these data show an increasing specification of what is planted where in the Columbia Valley in terms of white varieties. Have thoughts or additional context for the data discussed here? Leave a comment below. Note: In the tables below, I included to the far right my best guess on what might account for the acreage differences between the 2011 and 2017 surveys. These are, however, just guesses. Appellation information is only listed where data was provided. Other appellations were not provided or are zero. Note that, due to incomplete data as described above, the appellation data (listed as 'Appellations Total') does not equal the totals given for Washington (listed as 'Washington Total'). The zeroes in the Rattlesnake Hills are definitely reporting errors. Some Riesling has been converted to Syrah. I've not seen much change in Chardonnay. Sauvignon Blanc has not been zero since 1985, and is likely up some. I'm not knowledgable about who does what with PG. Paul, thanks for the perspective. I've also heard confirmation that the Red Mountain Sauvignon Blanc numbers are off as well as Walla Walla Valley Chardonnay numbers, as suspected. I need to follow up with the study authors as to why this might be the case.